Update! The pattern is now complete and ready for knitting! And it's FREE! Check it out here: Take the Trolley scarf. I'm working on the latest Red Scarf Project pattern and in the process of the development, I have given the draft of the pattern to some intrepid test knitters. Right away they encountered a bizarre little bobble and some stitches knit and purled through the back loops of random stitches. To knit my 2016 pattern for the Red Scarf Project, you need to know how to make a modified bobble. Here's how! Mb= make bobble: k1, p1, k1 all in the same stitch, then pass one stitch at a time over the first stitch. "k1 tbl" = Knit one stitch through the back loop. It's as easy as it sounds: you knit the stitch, but instead of knitting it through the front loop as usual, you knit it through the back loop. "p1 tbl" = purl one through the back loop. Sounds weird, feels even weirder, but the results are worth it! There you have it, three new videos from KnitOasis HQ, where the filming location might have been chosen in part to include my pretty new floors. Questions? Comments? Want to see more videos? Let me know. Now that I've edited and uploaded 3 in one day, I think I have the basic techniques down (except for sound, but then a silent video IS multi-lingual, after all) and I would love to improve on what I know while helping YOU improve on what you know as well! Thanks for watching! 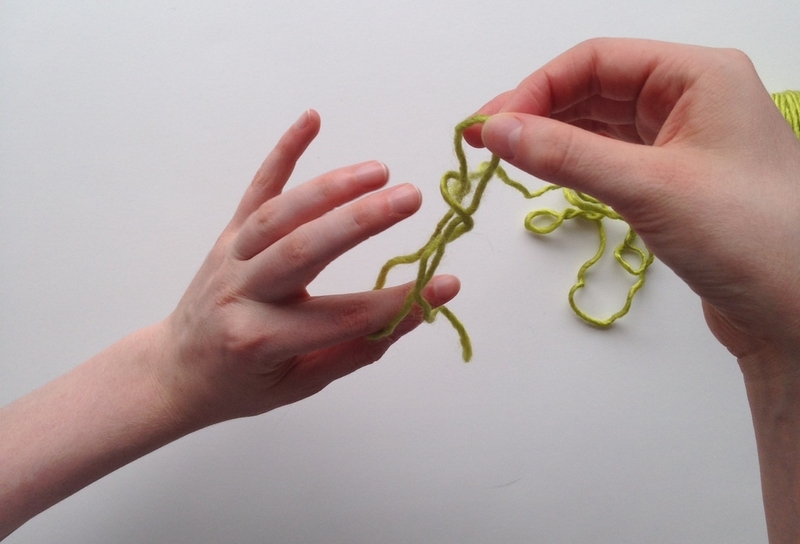 Fast forward to teaching classes where slip knots are necessary, and all I could think was, "How on earth can I do this as simply and easily as possible, since I want to make sure my students truly get this...and not become People Who Avoid Slip Knots??" I experimented with a few different ways to walk someone through the steps and tried them out in my classes until we had light bulbs coming on over every head (Eureka!). Why include this super basic, not that hard skill in my Simple Knitting Tips series? Every time I teach someone how to make a slip knot, even knitters who think they sort of know how to do it, I hear the cry of their hearts, the relief in their voices and the satisfaction of finally getting it. And that my friends, is music to my ears. Step 1: Pick up the yarn. Left or right hand--you decide. Step 2: Place the tail end of the yarn across your palm, with the working end of the yarn looped over your fingers, palm facing you. Step. 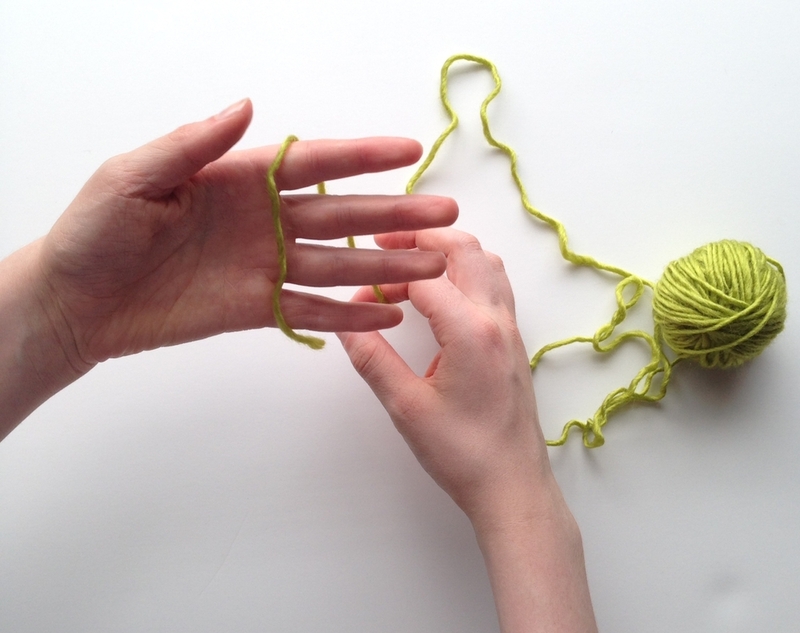 3: Pick the working yarn up and loop it toward you over your palm. 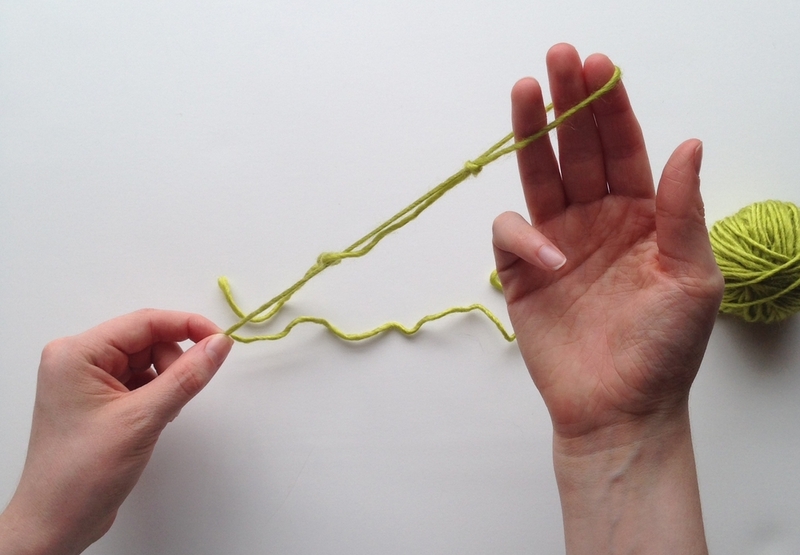 At this point, hold down the tail yarn (against your palm) with your thumb. The tail will be on your palm and the working yarn that you just looped will be on your fingers. Or if you prefer-->the tail end will be closest to your heart ♥︎ . The yarn is completely encircling your hand, but only once. Step 4: On the back of your hand, cross the working end over the tail end. Tuck the working end under the tail yarn, bringing that loop through the loop that encircles your hand. 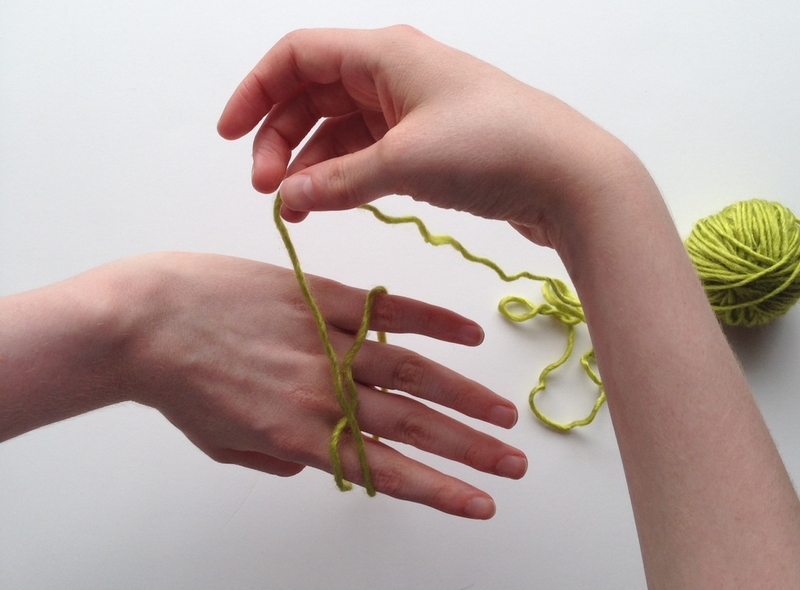 Step 6: To tighten your slip knot, pull the tail end with one thumb and finger while keep your other hand in the loop. You should now have a slip knot that can be loosened or tightened with the working end of the yarn. From here you can cast on stitches for something wonderful! The things they taught us. Also: Easter craft video! I wish we had iPhones with video recording capabilities when my grandparents were still alive. I'd have a video of my Grandma drinking a Coke and telling a story about how she talked someone into doing something, or of us going out to lunch. I'd have a video of her second husband, my step-granddad whom I always called Jimmy (that being his name and all), teaching me how to whistle through my hands. It was one of the few times I remember him taking the time to show me how to do something, and I cherish that memory. I can also whistle through my hands--just ask me. That set of my grandparents taught me many things, none of which I have on video. Grandma was a great cook, but she was also a great finder of excellent bakeries. There were always cookies from Heinrich's Bakery in her kitchen when I came over, and to this day I've never found their equal. Both Grandma and Jimmy could tell great stories, a gift that I imagine they put to use when they would go meet up with friends at the VFW Post. I always thought this was a very glamorous part of their lives. They were a bit cantankerous at times, set in their ways, somewhat profane, and I suspect I get a lot of my bossiness from my Grandma. They were also loyal, generous, funny, and gone way too early for me. Partly due to their early impact on my young life, I like to collect extra grandparents for my children. That sounds more ominous than it is, I promise. There is one particular man we know who adopts as his own ALL the kids at church. He traveled all over when he was in the Navy yet settled here when he retired (since once upon a time we had a pretty awesome Navy Base in Charleston. Jimmy was even here when he was in the Navy, many years ago). He has great stories to tell, always hands out candy at Easter, and makes our palm leaves into crosses on Palm Sunday every year. Every year I try very hard to learn how to do it, too. This year, I decided I would video the process so I could practice it on my own. He was a good sport (of course) and let me. So, here he is, Don Maddox, who along with his awesome wife Pat have been an extra set of grands to our kids (and the rest of the kids at our church, for the last 20 years or so), making a Palm Leaf Cross. Tutorial: I-Cord, I love you. I-cord is one of those knitting tools that make me happy I learned to knit. I realize it's not everyone's favorite thing to knit, especially when one is called upon to knit 3 feet of it, TWICE, when making bag handles, but I really like it. I like the way it starts out flat and then becomes 3-dimensional, a little like turning a heel. I like the way it's mindless knitting and one minute you look up from it and when you look down again, it has grown, as if by magic. I love that you can knit it by itself or use it as an edge on a finished project like a blanket. I love that you use double-pointed needles but knit in the round in a way that is unexpected. I just love it. Today, I'd like to show you how to knit a simple I-cord. All of the above examples use a cast on of 4 stitches. Obviously, needle size and yarn weight make a difference in the size of your i-cord. Knit one row, then, instead of turning your work so that the working yarn is coming from the right side of the knitting, slide the work down to the other point of the double-pointed needle. Your working yarn is coming from the left side ON THE BACK of your work. (figure 2) Knit one row, then repeat the process of sliding the work down. The tricky bit is to always remember to slide the work and not turn the needle around. With some practice you'll get the rhythm down. After you've knit a couple of rows (fig. 3) you'll want to give the bottom of your work a tug, pulling it down away from the needle. See what happens when you do that? You'll notice that your cord looks like a small diameter tube of stockinette stitch fabric. You can also make it look like garter stitch by alternating knit and purl rows. When you have reached the length you need, bind off. If you are attaching the cord to make it a bag handle, leave a long tail when you cut the yarn and use it to sew the cord on where it needs to go. It really is as easy as it sounds and it's a great tool to have in your Technique Tool Kit. For you seasoned I-cord pros, what are some of the ways you've used I-cord?